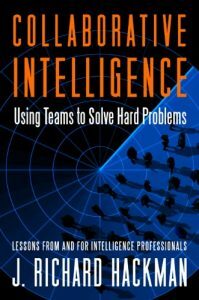 Collaborative Intelligence: Using Teams to Solve Hard Problems. J. Richard Hackman. I first met Richard Hackman in my doctoral studies. I was taking his course on the social psychology of organizations and the twenty five page reading list was an early hint that I might not have fully understood what I had signed up for. The enrollment was small so there was no place to hide. I did survive the experience and learned much of what was on that reading list. Better still, Hackman was THE authority on creating and leading teams. This book grew out of his work with the U.S. Intelligence community post 9/11. That work flowed out of the belief that “what is most needed these days to generate the insights that policymakers demand are interdisciplinary teams that cross traditional institutional boundaries.” That is a need that is central to the mission of any knowledge intensive organization operating in today’s environment. This book is Hackman’s distillation of decades of work with teams of all forms and missions. Much of what follows is solid, but unsurprising, advice for creating and directing teams. That doesn’t make it any less valuable, particularly given how often it is ignored in practice. In an interesting parallel to Fred Brooks’s observations about the “mythical man-month”, understaffing teams seems to produce extra motivation and energy, while overstaffing appears to mostly lead to problems not benefits. Perhaps the greatest advantage of teamwork is that team members have diverse information and expertise that, if properly integrated, can produce something that no one member could possibly have come up with. It is ironic, therefore, that teams typically rely mainly, and sometimes exclusively, on information that is shared by everyone in the group. Information uniquely held by individual members may not even make it to the group table for review and discussion. For decision-making and analytic tasks, that can significantly compromise team performance. This reinforces his advice that team effectiveness depends greatly on the design of team structure, membership, and performance strategies. Putting the information in the room is not sufficient; you must also explicitly design for surfacing and sharing that information. every group developed a distinctive approach toward its task immediately upon starting work, and then stayed with that approach until precisely half-way between its first meeting and its project deadline. At that point, all teams underwent a major transition that included altering member roles and behavior patterns, re-engaging with outside authority figures or clients, and exploring new strategies for proceeding with the work. Then, following that midpoint transition, teams entered a period of focused task execution that persisted until very near the project deadline, at which time a new set of issues having to do with termination processes arose and captured members’ attention. This would seem to contradict assumptions about what constitutes best practice in project management circles. Project managers are trained and rewarded for their ability to develop an initial plan and carry it to conclusion. Few project managers are likely to prepare or submit project work plans built around the assumption that the plan will be scrapped and rewritten halfway through the effort. The way that I reconcile this apparent contradiction is to observe that many projects are not about exploration or innovation but about executing to a well specified final result. Hackman and Gersick’s observations appear to be most relevant to teams tasked with addressing the non-routine. It suggests that project managers need to be very careful to understand and communicate the limits and relevance of mainstream project management practices when dealing with less well-defined questions. This is increasingly relevant in the turbulent environment that more and more organizations are compelled to work in today. This is not a long book, but it is dense. There is a lot of wisdom within that is grounded in a combination of rich field experience and rigorous thinking.